In addition to cranking out horror films left and right, Netflix has found its niche in addicting teen series. Whether it's the coming-of-age storylines found in On My Block or the twisted murder mystery in Elite, there are options out there for everyone. And, if you're a person who likes sci-fi mixed in with plenty of drama, it seems the streaming platform's newest option will be right up your alley. The Society doesn't arrive on Netflix until May, but the basic plot has already been released, as well as the trailer and a few official photos. The 10-episode series from showrunner Chris Keyser will follow a group of teenagers who are "mysteriously transported to a facsimile of their wealthy New England town," but soon discover their parents are nowhere to be found. It doesn't take long to realize that their newfound freedom is both thrilling and exceptionally dangerous, as alliances are formed and a new kind of order is established. And as we can see from the released trailer, "things got bad" very quickly, very dangerously. (So, essentially Lord of the Flies, but with a bunch of rich kids in New England.) In addition to in-fighting and backstabbing, the group will also face the struggle of how they're going to get home, which we're guessing won't be easy. 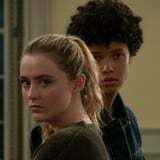 Blockers costars Kathryn Newton and Gideon Adlon will lead the cast as characters named Allie and Becca (respectively), while Sierra Burgess Is a Loser's Kristine Froseth will portray a teen named Kelly. Also on board are actors Rachel Keller, Alex Fitzalan, Sean Berdy, Alex MacNicoll, Grace Victoria Cox, and more. Watch the first teaser trailer above and check out photos from the series ahead!